Sparkle glitter fiberglass booth finish in bright purple school colors. The wolf mascot logo inlaid in the tabletops using school colors of purple and silver. Enclosed trash cans, just like McDonalds™. Before: Old, institutional tables in an unexciting room. 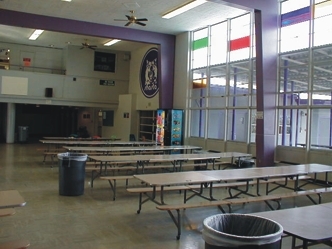 After: Sparkling glitter fiberglass booths in vivid school colors with school mascot wolf logo inlaid in the tabletops. 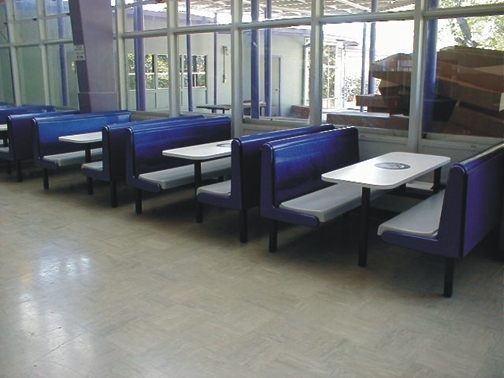 Call Barry Schuster to transform your dull, drab cafeteria or library into something beautiful and attractive! Copyright © 2015 Universal Seating Company - All rights reserved. Brodart logo is copyright Brodart, Inc.